Bank of America Corp. on Sunday completed its acquisition of MBNA Corp. in a deal worth about $34.2 billion, the nation's second-largest bank said. Charlotte-based Bank of America now has 40 million active credit card accounts on its ledger, making it one of the leading worldwide payments-services companies and issuers of credit, debit and prepaid cards based on total purchase volume. Bank of America's new card services unit will be led by Bruce Hammonds, who had been MBNA's chief executive. MBNA is the leader in so-called affinity marketing, with established branding relationships with more than 5,000 organizations and financial institutions, from the National Football League to L.L. Bean to hundreds of medical organizations. Under terms of the agreement announced June 30, shareholders of Wilmington, Del.-based MBNA will receive 0.5009 common shares of Bank of America plus $4.125 in cash for each of their shares. As part of the deal, Bank of America plans to eliminate 6,000 jobs across both companies. 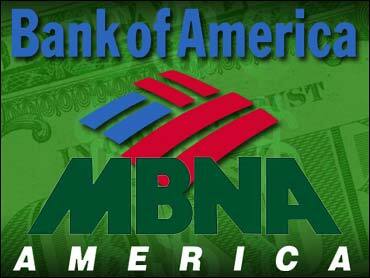 Bank of America says the move will help it achieve overall cost savings of $850 million by 2007. The company said Sunday that no decisions had been made on where the jobs would be eliminated. Before the deal, MBNA had about 24,700 employees overall. Bank of America had more than 177,000 employees. The company said other cost reductions will come from other sources, such as the elimination of overlapping technology and vendor leverage.